In 1995, John Daly unexpectedly won the British Open in a playoff with Italian Costantino Rocca at St. Andrews. Daly is known primarily for his driving distance off the tee (earning him the nickname "Long John"), his non-country club appearance and attitude, and his rough-and-tumble personal life. 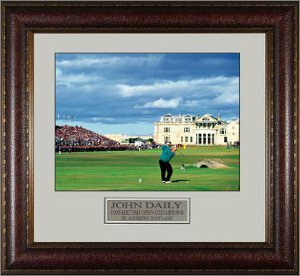 This is a Custom Leather Framed 11x14 Photo of John Daly from the 1995 British Open Championship.